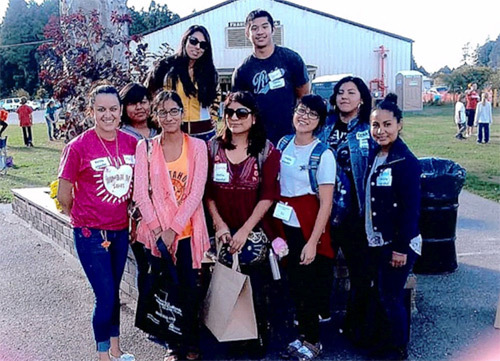 The “hidden” nature of the Latino community in Humboldt can sometimes make those members feel lonely or separated from their culture, but young volunteers from Puentes truly care to make a difference in their lives. As volunteers, we know in our hearts that one person can make a huge impact on someone else’s life, but the enigma is that the effects are rarely seen by the person making the change. This year, a young volunteer was able to experience one of those increasingly rare moments when an older community member approached her and expressed gratitude about how he was inspired by Puentes tutors when he was a student.. This exchange happened at this year’s Festejando Nuesta Salud (Celebrating Our Health), which provided a resource of healthcare outreach to the community; despite documentation, language or social status, everyone was served. Free routine check-ups, workshops, breast cancer awareness and various surveys were some of the services included, all of which were supplemented with translation from Puentes volunteers. As well as the amazing experience one single volunteer had, all of the members of Puentes felt they were appreciated and cherished by the Latino members of the community at this event, and came away feeling united by mutually supporting, and being supported, by those in need. Puentes volunteers at this years’ annual Festejando Nuesta Salud.